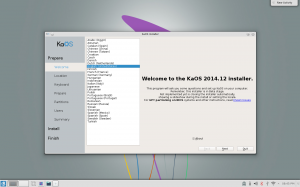 KaOS is very proud to announce the availability of the December release of a new stable ISO. This ISO marks two major milestones for this distribution. Since it's inception almost two years ago, a need to be ready for UEFI installs has always been a priority. That was tied though to getting a modern Qt based installer that could handle such UEFI installs. With this ISO, both are implemented. The new, Qt5/python3 based installer is a joint effort of several distributions. In May of this year, developers of Netrunnner, KaOS and Manjaro got together to discuss the possibility to work jointly on a brand new, Qt5 based installer. The idea was born to create Calamares. By June the coding started and by August a first, raw usable version was put into testing for KaOS-kf5 based ISOs. Currently, Calamares is being developed with contributions from BBQLinux, Fedora, KaOS, Kubuntu, Manjaro, Maui and Netrunner. Calamares is an installer framework, entirely modular. Being that modular shows on this ISO, since it uses about 25 % of the modules that are KaOS specific, but all stays entirely integrated. Please understand though, Calamares is not at a stable version yet, it is at beta stage, and certain parts are not implemented yet. To see Calamares in action see this video. 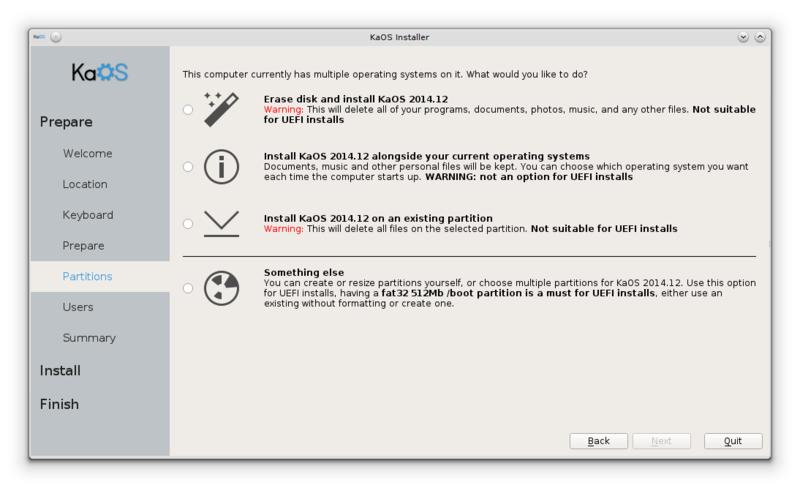 For UEFI installs, KaOS uses the simple, transparent but quite powerful gummiboot as bootloader. 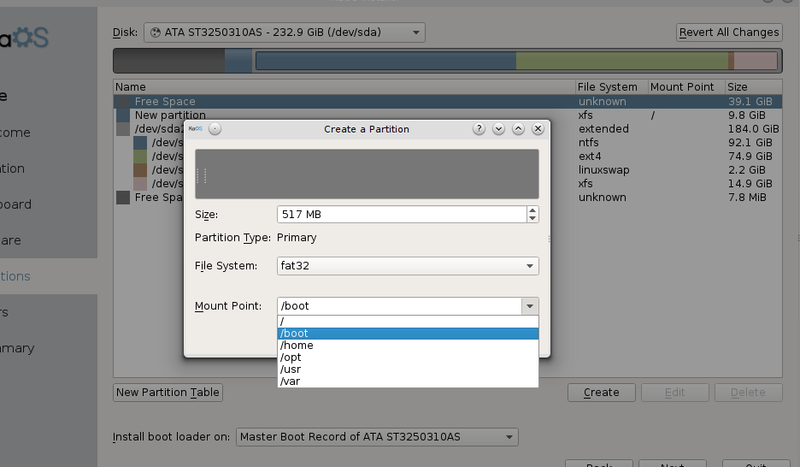 This ISO is a first to have the split way of releasing from KDE. The applications are KDE Applications 14.12.0, bringing new features and bug fixes to more than a hundred applications. The base of KDE is more in a frozen state now, those are at 4.14.3, were the lts kde-workspace is at 4.11.14. The all new Qt 5.4.0 is bringing new features like the chromium based qtwebengine and qtwayland. 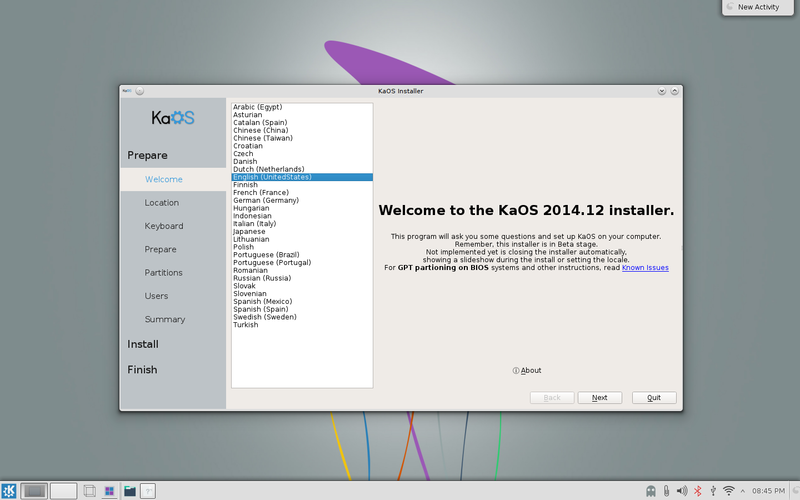 The Qt5 based KDE Frameworks 5 packages are starting to get integrated into the KaOS repositories. Examples of packages using frameworks are the default web-browser Qupzilla, package-manager Octopi and the installer Calamares. The base of the system underwent quite some change. An all new GCC 4.9.2 and GLIBC 2.20 toolchain was build. Systemd moved to 218, with that move firmware loading is no longer handled by systemd, but is now done by the kernel. 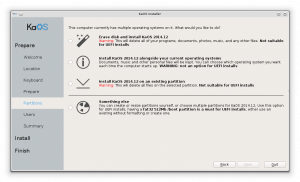 Linux 3.17.7 was build in such a way that it can accommodate those changes. Cellix keeps improving the KaOS Community Packages helper "kcp". It is now go based, can do searches for outdated packages, list all packages, list the packages by popularity, much faster searches and improved handling of building & installing packages.